It seems like it’d be hard to miss an animal the size of a lion named for its serrated, sword-like teeth. An animal like Homotherium latidens, or the European scimitar cat, was once one of Europe’s most formidable predators, at least until 300,000 years ago, when it seemed to have gone extinct. However, a jawbone pulled from the North Sea is rewriting that timeline by 270,000 years, as both carbon dating and genetic evidence suggests it was alive as recently as 28,000 years ago. This younger specimen is now raising a lot of questions, as new causes for extinction, new ecological niches and that giant gap in the fossil record all need to be reconsidered. 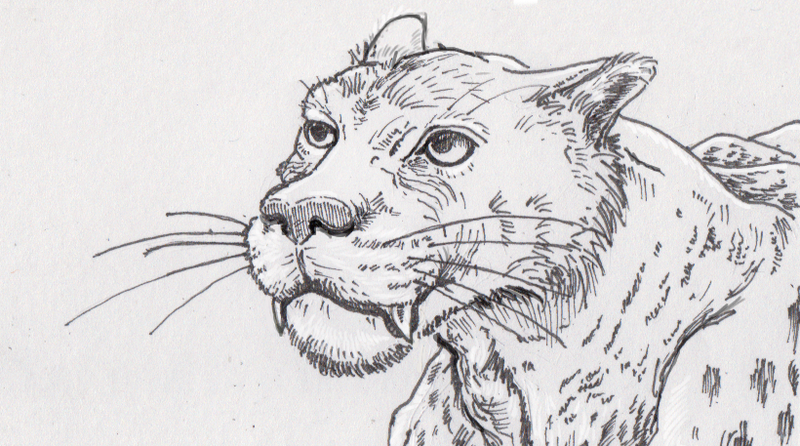 Homotherium were like slightly scaled-down versions of their more famous saber-toothed cousins, like Smilodon. Nonetheless, this cat still had two large, canine teeth, and their knife-edge shapes suggest they were probably used for cutting and slashing rather than simply impaling prey. It’s hard to know for sure, because the humans that we now know lived as neighbors to these scimitar cats unfortunately didn’t leave any good field notes behind. Even cave paintings of predatory cats found in norther France somehow omit any solid portraits of H. latidens. One of the possible explanations for Homotherium’s absence in the fossil and written record may be that they just weren’t around much. One hypothesis to explain how the cats could be alive without leaving behind more evidence is that they had gone on a very long migration, possibly even around the world. This idea is slightly bolstered by some the fact that the cats’ closest relatives are known to have turned up in North America, although that relationship is also being reexamined. Looking at the mitochondrial DNA recovered from the new jawbone, researchers were able to not only date the specimen, but also see where it fits in the larger cat family tree. They found that H. latidens is remarkably similar to its North American kin, Homotherium serum— so much so that it’s been suggested that they might be the same species in a new location. This similarity is in contrast to H. latidens’ relationship with other cat species, which forked away from each other 20 million years ago. While they do share a common ancestor, your house cat is more closely related to a modern tiger than Homotherium is to other saber-toothed cats like Smilodon. Assuming that we’ve now found the most recent H. latidens bone on the planet, scientists now have to think about what caused its final extinction 28,000 years ago. As presumptuous as it sounds, there’s a fair chance that these cats really did go extinct at that point (really!) if only because so many other animals were being removed from the food chain around the same time. Europe was experiencing an ice age at that point and coming to grips with more efficient human hunters. The combined ecological stresses likely explain not only the extinction of these saber-toothed cats, but other megafauna like mammoths and cave bears as well. As big an upheaval as this new bone has caused, it’s worth remembering that this isn’t the first time paleontologists have had to rethink extinctions. You can’t predict what fossils will be found, and while most species seem to cluster geographically and chronologically, they can surprise us with their extended survival. Just this month, another extinct mammal with big teeth extended it’s timeline, but by five million years. 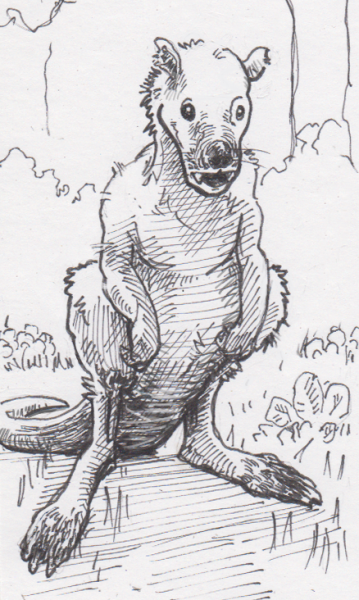 Fanged kangaroos like Balbaroo fangaroo weren’t exactly impressive predators, as they were browsing herbivores that scurried around ancient Australia, but they apparently did better than we’d previously given them credit for. Like the European saber-toothed cats, the pressures that drove them to their (final!) extinction is now be rethought, since in their case they seem to have outlived their regions major climate crisis known to have taken place 15 million years ago.